Hope everyone is finding their way here! I know there have been problems with my feed so if you follow me via RSS, you may want to delete my old link and start new here. Same with my Facebook/Twitter posts. I’m trying to figure it all out, but the techie moron that I am is having major issues. Thanks for your patience! The temps here in NJ have been BITTER cold the past few days. I tolerate freezing weather better than anyone I know, and even I’m having issues with this. It’s really, REALLY chilly. Which means – comfort food is a MUST. My friend Sarah has mentioned this dish a few times, so I figured it was well worth giving the recipe a try. And I’m glad I did. Delicious! Cook egg noodles according to package instructions. Preheat oven to 400 degrees. Mix ingredients for meatballs together and shape into bite size balls. Place on nonstick baking sheet (lined with foil if you like) and bake for 12 minutes. Melt butter for sauce over medium heat. Sprinkle in flour and whisk continuously until a smooth paste forms. Continue whisking while adding sherry and cook until reduced in half. Add broth while whisking until sauce thickens enough to lightly coat back of spoon. Turn off heat. Mix in salt, pepper, mustard and sour cream. Drain noodles and toss with butter and parsley. Add meatballs to sauce, stir to coat and place over noodles. I couldn’t live without comfort food in this weather! 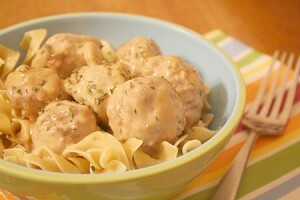 these swedish meatballs sound so good! PS. Loving the new site!